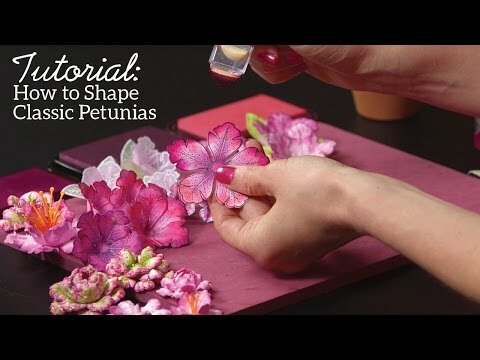 For more tips on creating with the Classic Petunia collection, watch the tutorial at https://youtu.be/KOy_qNB9OAk. Instructions: The finished card measures 5 inches by 7 inches. To make the card base, cut a card stock two pieces, 5 inches by 7 inches and 5 inches by 7 1/2 inches. Score the second piece at 1/2 inch on the long side. Apply glue to the inside of the flap and attach the first piece. Open the card and keep on scoring board vertically. Score on the front of the card base at 1/8-inch intervals. Apply distress ink all over with foam applicator and spritz with water to get a nice water colour background. Stamp the petunia images that are shown on the card on white card paper. Color with water color pencils and cut with matching dies. Stamp the sentiments from the Just For You sentiment set with black archival ink. Using the banner die and the small circle die, cut out these sentiments. Cut a decorative die from the intricate frame die set. On the card front, place the decorative die and mark the edges lightly with pencil. This will help you to place the stamped images. Now add the stamped image of the big petunia as shown adhering them with foam tape. Cut a vellum paper to the size of the decorative die cut and adhere to its back using clear glue. Adhere the decorative die cut with vellum on card front as shown. Add the petunia swirl image on top. Add the sentiment die cuts with foam tape. Finish with clear water droplets and glue.